Imagine you come late to a party and a group of your friends has already arrived and is involved in an animated discussion. What do you do? Chances are good you might join your friends and see what the conversation is all about. Only after getting a sense for what they're talking about might you jump in and participate. One theme I've discussed a number of times is that we can think of market activity as a conversation among various participants. The flow of prices captures the transactions occurring among market makers, active day traders, longer-term thematic participants, asset managers, etc. The skilled trader is the skilled listener, picking up on the nuances of the market conversation. As in the example of the party, that requires a willingness to stay silent and get a sense for the conversation before jumping in and participating. Too often, traders formulate their views and impose those on the market without truly listening to the flow of conversation. That is like the boor at the party who talks at you, not with you, hogging the conversation with what they want to talk about. Rarely does that work socially, and even more rarely does it provide an edge in financial markets. When we're full of ourselves and our own views, we become less sensitive to the flow of conversation in the market, missing what is often obvious in retrospect. 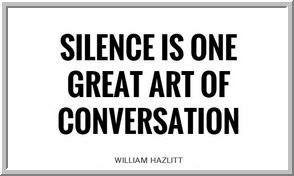 That is why silence and a quiet, open mind are great tools for starting the trading day. It's also why the questions that are most important to ask about any market are those that pertain to the flow of conversation among participants. One heuristic I've found helpful is to divide recent market volume into quartiles: low volume, low-average volume, high-average volume, and high volume. At each quartile, a different class of participants has become active in the market conversation. What are the prices at which the conversation is picking up or dying out? When a new group enters the conversation, how "sticky" is their participation? Do they continue and pick up their involvement or fade away? If we look to upticks and downticks, volume occurring closer to the market bid side or offer side, how balanced is the conversation? Do we see a growing tilt to the direction of the conversation? If we do enter the market with a larger picture view, staying open minded with respect to here and now flows can provide us with valuable information for when our good idea becomes a good trade. The excellent trader is the sensitive listener; emotional intelligence helps us execute our intellectually intelligent ideas.